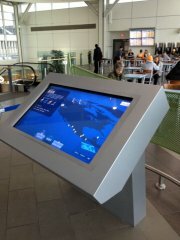 Custom aluminum display to hold touchscreen. Hidden access panels. Touchscreen by others. 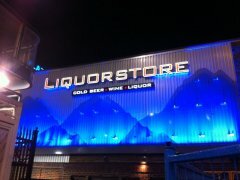 Face-lit US LED illuminated channel letters. LED illuminated box with push-through acrylic. 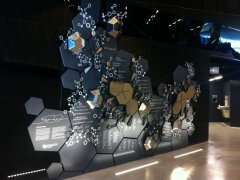 Mountains are shaped out of perforated aluminum and backlit with LED wall washers.